As tech giants grapple with how to detect and scrub misinformation and propaganda from their social media platforms, French President Emmanuel Macron has a more extreme approach: Block the whole damn website. In a speech to journalists on Wednesday, Macron said he planned to introduce new legislation to strictly regulate fake news online during political campaigns. His proposal included a number of measures, most drastically “an emergency legal action” that could enable the government to either scrap “fake news” from a website or even block a website altogether, the Guardian and Politico reported. Macron, himself a target of election interference, also outlined some less extreme measures in his speech yesterday. He proposed more rigid requirements around transparency, specifically in relation to online ads during elections. 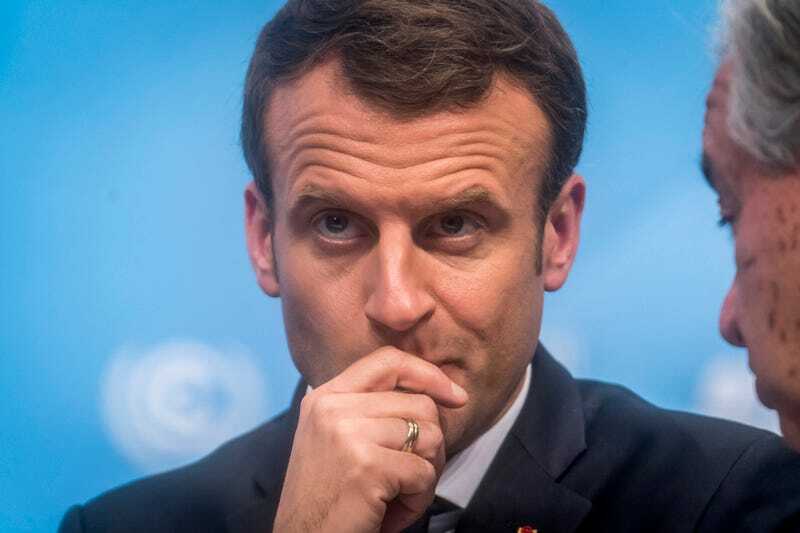 According to the Guardian, Macron said the legislation would force platforms to publicly identify who their advertisers are, as well as limit how much they can spend on ads over the course of an election campaign. Under scrutiny, Facebook and Twitter have taken steps towards increased ad transparency. In October, Facebook started requiring political advertisers to disclose more information about who they are. That month, Twitter announced it would start disclosing more information about ad campaigns, including the total amount spent as well as who paid for them. Twitter also announced it would let users see more information about targeted ads specific to them, and require political ads to be labeled more clearly. Macron’s legislation might hold tech companies more accountable for the proliferation of misinformation on their platforms. By requiring more transparency from political advertisers while capping how much money can be spent on political ads during elections, it’s possible the government could curb the spread of misinformation online. But a social media kill-switch feels less like a champion of democracy and more like a desperate, knee-jerk reaction to newfound frustrations with poorly policed platforms.